ATLANTA — Electric vehicles will have a large role in trucking’s future, but there are challenges, including emerging technology, said a PepsiCo Inc. fleet executive. 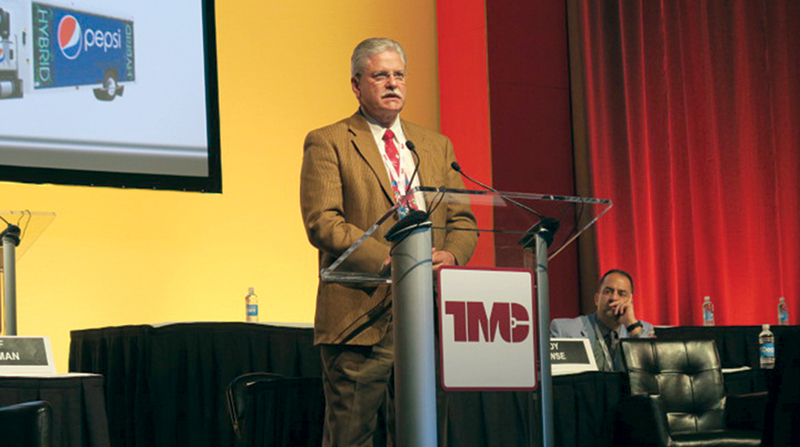 Johnston, a panelist at a March 7 session on heavy-duty vehicle electrification at the Technology & Maintenance Council’s annual meeting here, spoke with Transport Topics after the event. About 10% of PepsiCo’s fleet is either plug-in electric or electric hybrid, Johnston said. At its Pepsi division, this includes Class 6 and 7 hybrid trucks/tractors and Class 2 hybrid vans/pickups, according to a slide from his presentation. At its Frito Lay division, this includes Class 6 plug-in electric straight trucks. He also stressed that trucks run on software. “The modern vehicle is no better or worse than the software that is controlling it. Consequently, if a technician has a truck with a problem and they pull it in the shop and the first thing they do is go grab their wrenches and open the tool box, they went the wrong direction. They need to go get the laptop and plug in to the truck,” Johnston said.